When out and about on a school or family trip, you never know when emergency will strike. The Child Size Foil Survival Blanket is a highly reflective and insulating blanket that will protect children against the elements during emergency first aid situations. Created to effectively retain body heat while outdoors, it is excellent in preventing hypothermia while waiting for rescue. This survival blanket provides superior protection for children when out in emergency evacuations scenarios, ensuring that they won't be affected by adverse weather conditions such as strong winds and heavy rain. It aids in the prevention, or even the treatment in some cases, of hypothermia. Both sides of the foil blanket feature a heat-reflective metallic surface that is designed to retain 90% of the user's body heat, providing minimal heat escape. The reflective nature of the blankets will also naturally reflect light, meaning that wearers can be seen from great distances by rescuers or emergency services. The survival blanket is perfect for keeping in child care or travel first aid kits to ensure that you have emergency supplies should you be faced with an accident or emergency evacuation. 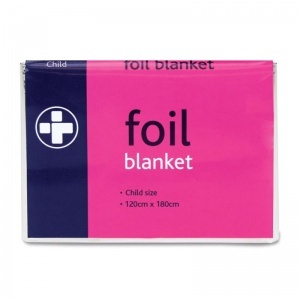 Available in packs of 10 individually wrapped foil blankets. The Child Size Foil Survival Blanket is usually dispatched via First Class Royal Mail and delivery should be within 1 to 3 working days.